Imagine hammock camping in places without trees or mounting on trees is prohibited. The ultimate alternative is to have a portable hammock stand. These stands are designed to enable easy storage and portability. This allows secure carrying whenever going outdoors. These accessories are perfect for relaxing in backyards if you have unlimited space and there are no trees. I know many people though love hammock camping, getting portable stands can a hard nut to break. However, I have a perfect choice for that won’t discourage weather outdoors or in your backyard. 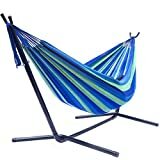 If I were to go for a hammock stand, Best Choice Products Double Hammock with a stand would be my best selection. The stand is made of steel which makes it sturdy and supports heavyweight. This means the stand together with hammock can be used virtually by everyone. My second reason is this stand is wide which enables it to have high stability. In fact, with a frame having the ability to accommodate up to 450 pounds, you can enjoy in style. When I compare it with others on Amazon, its only product with over a thousand reviews and have an excellent rating of 4.3 out of 5. The thirst to have a complete hammock stand is now over. 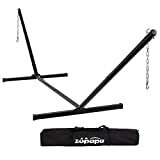 The Zupapa heavy duty hammock stand with chains is the perfect solution camping in places without trees and other mounting points. Regardless of the brand of your hammock, this stand is designed to have universal compatibility without any hitch. Enhanced with a carry bag, your trip is now smooth and unforgettable. The time when people had to camp in forested areas is over. These days you can do it anywhere and still enjoy suspended nights. All you need is this heavy duty hammock stand by Zupapa. Made to carry up to 550 pounds, the stand can comfortably accommodate two people. Therefore, even when camping with your partner, you only need one hammock. Well, designing of this frame is fantastic. It provides you with a freedom to choose your ideal size since its available in 12-15 feet range. In the end, it has chain reinforcement that enables it has a perfect fitting of any hammock. The 12 gauge steel with end protectors prevents injuries as well as dirt which give it extended lifespan. Zeny double hammock with space saving steel stand gives you comfort and easy storage once camping is over. Amazingly, it’s a combination of a hammock and durable steel frame that keeps you fully supported and suspended without sagging. With outstanding capacity, the structure can handle two people. When looking for comfort in a bare field without trees or hammock mounting rocks, it’s like trying to milk chicken. All this is now solved if you can get this hammock with portable stand from Zeny. Designed with double capacity, the hammock doesn’t sag and has 100% cotton made. Now, the important thing here is the stand used in this hammock. It is designed to last for years making it possible use even when the hammock is worn out. In fact, the stand frame boasts solid steel construction that is hard to bend or break. The plastic covers on foot enable the stand to be ideal for use indoors. With 5 hooks attachment, you easily install the hammock. The Sunnydaze universal steel hammock stand is all you want and mounts any hammock with confidence. The designing and materials used enable you to relax without any worry of this stand collapsing of bending the frame. Furthermore, it can support 9.5 feet to 15 feet long hammocks. Why should you allow yourself to sleep on the ground while you can safely relax while suspended? Whether camping on desert or the beach, with a hammock and strong stand, you will get smooth time. The Sunnydaze universal stand can be used with any hammock due to its structure and construction. 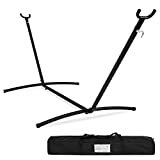 With a sturdy frame, the stand doesn’t bend when slipping which can lead to hammock staging. In fact, boasting a weight capacity of 440 pounds, there is no chance of compromising your comfort. Amazingly, assembling doesn’t require any unique tool or more than one person. With compact design when collapsed, it enables smooth carrying. This is another stand for hammocks by Sunnydaze that is ready to transform any place into a hammock camping ground. Whether it’s in your home compound or camping ground, you won’t have to sleep the ground again. The lightweight frame is ideal for everyone as it can accommodate 300 pounds. Have you encountered a complicated to assemble hammock stand that takes you a lot of time? There is no need to buy such products. The only thing you need to look for is this portable stand for hammocks by Sunnydaze Décor. With simple assembling process, you don’t tools or anybody else for assistance. The construction 1.25-inch steel tube is incredible in delivering high durability and sturdiness. On the other hand, enhanced with rust-resistant coating it doesn’t wear out quickly due to weather elements. The universal compatibility design enables fitting hammocks that are 10 feet. Buying a hammock stand isn’t rocket science. Its easy process and have excellent relaxation without struggling to look for trees. Lazy Daze has eased your work since they deliver a hammock with a stand to make ready for use anytime you need it. The Lazy Daze hammock with a stand is a good choice ready for use on various occasions. Combining a hammock and stand, it means you will enjoy your time without buying each thing separately. In fact, the canvas hammock is sturdy and non-stretchy to keep you intact without sagging. Moreover, the head pillow is absolute to keep neck and shoulder support. When we come to the stand, it’s designed to support weight equivalent to the hammock. Designed to carry 450 pounds, it means comfortable feeling without destroying the frame. Carrying this frame is easy since it consists 5 pieces that are simple to assemble. Accompanied by free carry bag, storing and porting are easy. It is time to change how you relax at your home. You can only improve your experience by getting this hammock and stand from Sorbus. Premiumly made products with heavy-duty materials they guarantee extended durability. Therefore, you can relax and swing just like tree mounted hammocks. 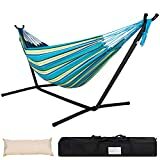 The construction of this hammock with space-saving stand is to provide a cheap way to have a hammock in any situation. Whether strapping hammocks in trees is prohibited or there are no trees, swinging nowadays is a must. With ample surface area hammock, it lets you relax the whole body. Well, the hammock comes with a space-saving stand. This ensures you can use it both indoors and outdoors. Unlike large frames, this one can be collapsed easily to allow storage and portability. The weather-resistant steel can handle 450 pounds hence great for two people. The structure is stable with great balancing that lets perfect relaxing for years. Are you ready to make your patio a relaxation point without complicated processes? Get this hammock with a portable stand from Driftstun and set it whenever you like. The important bit is that stand is steel made, and light which facilitates easy portability also, setting up is a minute job without tools or assistance. 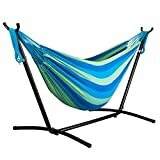 It’s one of the best portable hammock stands that come together with a hammock. The Driftsun hammock is strong and supports you entirely due to the cotton fabrics construction. The large design further enables it to handle tow adults with its weight rating of 450 pounds. Therefore, when you relax with your partner, it’s an instantaneous way of achieving it. Supporting this hammock is the portable fame that is, made of weather resistant steel. With this, you can use it under any weather condition without getting corroded or rusting. The frame is easy to set up and also break down making it one of the easiest to set up. For simple ways of transporting it when traveling, a carrier bag is provided. SueSport is an excellent friend when you need to relax anywhere with your hammock. You don’t need trees since it provides you with a hammock and a portable stand. In fact, this double hammock with a space saving stands enables easy setup. 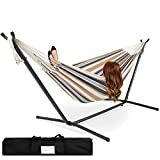 The combination of cotton hammock and steel stand will give you peace of mind and perfect fun. Enjoy exceptional comfort with your partner but getting a reliable hammock and its stand from SueSport. The whole set is made with safety and comfort in mind. That is why hammock features cotton fabrics which are strong and non-stretching. Consequently, even when relaxing for long, it won’t sag. Supporting the hammock is a durable frame which can accommodate two people and a maximum weight of 450 pounds. This stand is efficient as it eliminates the need to strap your hammock on the trees. As a result, it’s possible to camp anywhere and enjoy hammock relaxation. Withstand boasting resin steel construction, its steady and assembling is a breeze. Having plans to go for outdoor vacation? One of the best ways to make it successful is looking for a hammock and stand. 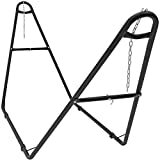 The Best Choice Products steel hammock is among the best pick to have better suspension. With high portability, available in different sizes and great finish, this stand is highly reliable. Once you think about getting a stand to mount your hammock, it should be strong enough to support you. Selecting this one by BCP, steel hammock stand is making your outdoor experience a complete one without drawbacks. The construction boasts strong steel that is weatherproof powder coating to maintain its durability. Well, the stand is 9 feet long, which means all people, can use it without causing discomforts. On the other hand, it is also available in different sizes that let you choose your perfect one. In fact, the stand offers you the freedom to select ones with up to 15 feet. Setting up is a piece of cake and come with a carrying bag. Best Choice Products is a maker of the variety of products that are aimed at improving people lifestyle everyday. 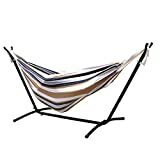 This hammock with steel stand is created to provide relaxation in your home and also when going outdoors. The stand is strong, stable and easy to put up without requiring tools or other people. Well, when you buy this hammock by BCP, you don’t have to buy a stand independently. Once you have it, the hammock is ready for use since it has everything you need. The hammock is made from strong cotton fabrics to make sure comfort and strength. 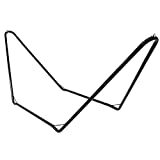 To support the hammock properly, the frame is large and improves stability to prevent toppling. The stand features steel that is capable of holding two people. With this, it has a maximum weight of 460 pounds. Notably, with easy to assemble and disassemble, it renders the whole set easy to port. Enhanced with a durable finish to withstand all weather conditions, it doesn’t rust or corrode.